At high altitudes, UVA rays – which are pernicious because they are barely perceptible – are no longer filtered by the atmosphere. At the same time, clouds reflect up to 85% of this radiation, which can penetrate the aircraft virtually unhindered. Scientists have calculated that pilots are exposed to a considerable amount of UVA radiation: flying at 30,000 feet for 56 minutes is equivalent to 20 minutes at a tanning salon. UVA rays can disturb the genetic makeup of skin cells and the damaged cells can become cancerous. The rays also cause the skin to age faster. On board an airplane, the air pressure is extremely low – equivalent to the pressure at an altitude of between approximately 2,200 and 2,400 meters, where it is only about 0.6 bar. This is considerably different from the air pressure on the ground (1.013 bar), which is needed for normal skin regulation. Extremely low air pressure like this causes the lower layers of skin in particular to lose a huge amount of moisture, damaging the skin flora. The humidity in the cabin is just 5% to 15% at cruising altitude, compared with 40% to 60% on the ground, which is a comfortable level for your skin. The very dry cabin air means that skin loses a great deal of moisture, causing it to dry out very quickly and become tight. During a flight, there are a large number of people in a sealed cabin. It is therefore inevitable that the cabin also contains a large number of bacteria that come into contact with your skin. 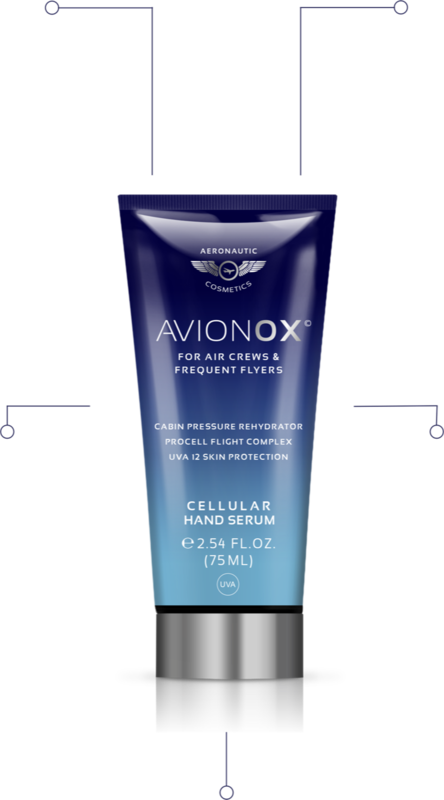 THE HIGHLY EFFECTIVE COMBINATIONS OF ACTIVE INGREDIENTS USED BY AVIONOX WERE SPECIFICALLY DEVELOPED TO COUNTERACT THE PROBLEMS THAT AIR TRAVEL CAUSES FOR SKIN. With an extremely effective, high-dose antiaging complex specifically developed to counteract skin aging – especially on your face – due to damaging factors on board the plane.